emperumAn asks “Are your truly desirous [of me] as said in ‘ichchAmi‘ [in the previous SlOkam]?” and ALavandhAr replies “I who am dull-minded cannot express in your divine presence that I have the desire which matches your greatness. You should reform my mind by accepting the words expressed by me highlighting my desire and make that truly occur in me”. Evam bhUtham mE mana: Sikshaya – you should mercifully reform such mind of mine. Oh emperumAn who lifted up the earth! 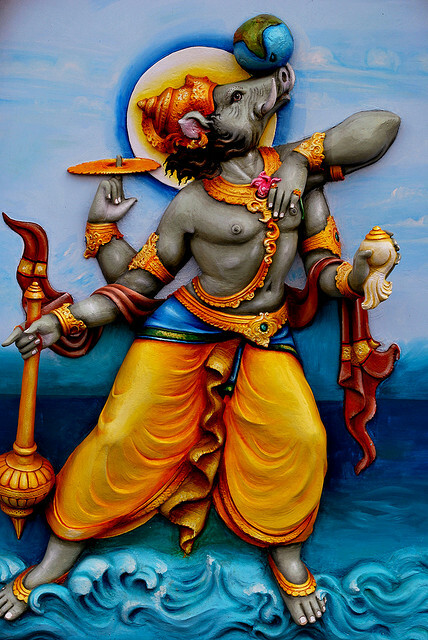 Though this servitor (I) is covered by rajO guNam (passion) and thamO guNam (ignorance) and doesn’t have the desire, like the one who who has true desire, even if I engaged in deceitful praises using this type of words, considering that as the reason, out of your mercy, you only should mercifully reform such mind of mine. Evam anichchan api – Though ALavandhAr does not have the desire that matches up to the greatness of empeurmAn which was explained previously, since he is not a nAsthika (atheist/disbeliever), he would not say that he does not have the desire. Since his desire does not match up to the greatness of the benefit, he would not say that he has the desire. punar ithi ichchan iva – Like those who have true desire. chadhma sthuthi vachana bhangI marachayam – I performed deceitful praises in such a way that it was believable. Looking at the way I praised, even your highness who is omniscient will believe my words. As said in thiruvAimozhi 5.1.1 “poyyE kaimmai solli” (Telling lies only). rajas thamaS channa: – Being covered with rajas (passion) and thamas (ignorance which lead to anyathA gyAna (misunderstanding the attribute of a particular entity incorrectly) and viparItha gyAna (misunderstanding the entity itself incorrectly). Since time immemorial, that body covered the nature of self and the nature of god, through this rajas and thamas. thathApi – Though I engaged in activities which are to be given up. I must be given up [by you] as I should have survived by speaking the truth as said in “yAthA thathyEna varNitham” (expressed as it is) in front of you, the omniscient, but I ended up speaking falsity in front of you. iththam rUpam vachanam avalambya – Only considering the words such as “na dhEham na prANAn” (don’t want my body and life), “dhayA sindhO bandhO” (Oh ocean of mercy! Oh you who is related to me!”). emperumAn is of the nature that he will protect just for the words spoken [without even checking the heart] as said in thiruvAimozhi 2.7.3 “mAdhavan enRadhE koNdu” (Just for reciting his name, mAdhava), thiruvAimozhi 10.8.1 “thirumAlirunchOlai malai enREn ennath thirumAl vandhu en nenju niRaiyap pugundhAn” (I just said thirumAlirunchOlai malai, and SrIman nArAyaNan entered my heart and filled his presence there fully). krupayA – Due to emperumAn’s subservience to his own mercy, as said in SrI rAmAyaNa SlOkam sundhara kANdam 38.34 “vadhArham” (deserve to be killed), with respect to the defects [of the devotees], he remains “avigyAthA” (ignorant) [i.e., emperumAn ignores the defects of his devotees]. dharaNidhara – Your highness is the one who lifted up bhUmi (mother earth) who had sunk to the level of rasAthala (one of the lower regions). As said in thiruvAimozhi 5.7.6 “EnamAy nilam kINda ennappanE!” (Oh my father who lifted up the earth as a pig!) and in periya thirumozhi 1.1.4 “panRiyAy anRu pAragam kINda pAzhiyAn” (The majestic varAha emperumAn who lifted up the earth), you have both the relationship (as the lord) and the power respectively. So, all he [the AthmA] needs is the desire [for such emperumAn]. ALavandhAr says emperumAn should create such desire [which matches emperumAn’s greatness] in him and protect him. This entry was posted in Other, sthOthra rathnam on March 9, 2017 by Sarathy Thothathri.